April is National Donate Life Month, a time used to increase awareness about being an organ donor. 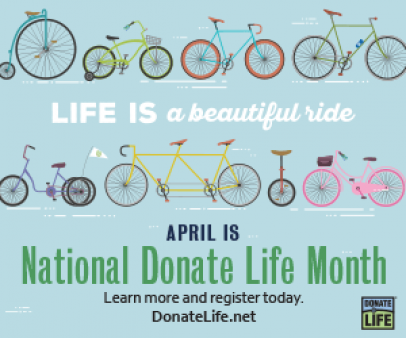 This year’s theme is, “Life is a beautiful ride.” The image of a bicycle is a lovely opportunity for us to consider our role in the lifesaving and healing journey of helping to inspire others to provide hope through donor registration and living donation. People with hepatitis C virus (HCV) can be organ donors. HCV-infected organs have been used for liver, kidney and heart transplantation. In a 2019 study published in the American Journal of Transplantation, nine patients at Penn Medicine were cured of hep C following lifesaving heart transplants from deceased donors who were HCV-positive. Every year, 8000 people die in the United States while waiting for an organ that did not arrive in time. That is 22 people every day, or nearly one person every hour. You aren’t too old to donate. There is no upper age limit for organ donation. Organs from donors over 80 years old have been used with success. One in three of deceased donors are over age 50. Organ donation does not affect funeral plans. An open casket funeral is possible for organ, eye and tissue donors. Through the entire donation process the body is treated with care and respect. Funeral arrangements can continue as planned following donation. Living donors made it possible for more than 6,000 transplants to occur. Living donation saves two lives: the recipient and the next one on the deceased organ waiting list. Kidney and liver patients who are able to receive a living donor transplant can receive the best quality organ much sooner. It saves a lot of suffering. Bonus Fact: The stories about black market organs are myths. There is no truth to the story about the out-of-town business man whose drink was laced with a knock-out drug who woke up in a bathtub filled with ice along with a note instructing him to call 911. The dramatic ending is that the person had his kidneys removed by black market bandits. This story is completely false. It is illegal to buy or sell organs or tissue in the U.S. Every transplant is rigorously reviewed by a team. My stepson donated one of his kidneys to his brother’s wife. The experience deepened my commitment to the goal of raising awareness about living donation. On behalf of the 114,000 people on the waiting list, please take a moment to consider being an organ donor, whether while you are alive or upon death. Click here to register your wishes to become a donor upon death.